The 2019 Earth Ring Ceremony will be held Tuesday, April 9th in the Alumni Memorial Building on the UNB Fredericton Campus. Welcome Reception begins at 6:00 PM with the Ceremony to follow at 6:30 PM. All New Brunswick geoscientists who already have an Earth Ring are welcome to attend the Ceremony and Reception to welcome new graduates into the profession. Please RSVP to info@apegnb.com if you plan on attending. Any practicing New Brunswick geoscientists without Earth Rings wishing to become obligated and receive a ring are also welcome to participate. Please download the registration form and place your ring order. The ring is worn on the smallest (pinkie) finger of our working hand. Please have your finger sized by a jeweller before ordering. The deadline for ring orders is 3:00 PM, March 4th, 2019. To take part in the ceremony and receive an Earth Ring, you must have obtained a geoscience degree from a recognized university. 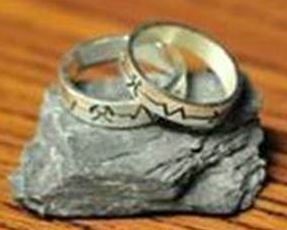 The Earth Ring is a symbol of the professional oath you are asked to take during the ceremony and, as such, attendance is mandatory in order to receive your ring.